There was a time when it was enough for an emergency breakdown service to employ staff who wore a smart uniform, saluted promptly and could kick your tyres in a reassuringly authoritative manner. Competition these days is much more fierce and motoring organisations have to offer additional services if they want to stay in the game. For example, most vans are now equipped with games consoles and Blu-ray players to keep motorists entertained while their vehicle is being fixed. Some even employ children's entertainers who will mount an impromptu show on the hard shoulder for the benefit of younger passengers. But it is the development of emergency catering which has proven to be most popular. In the event of a breakdown, the RAC will now despatch a pizza to the stricken motorist and this often gets there before the recovery vehicle does. 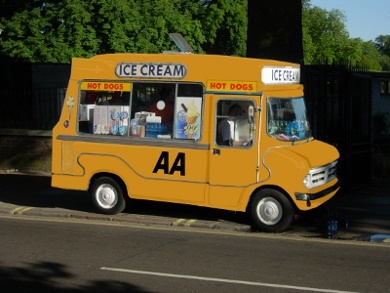 The AA, meanwhile, has invested in a fleet of ice cream vans, whilst Green Flag do a respectable line in burgers. In fact, these initiatives have proven to be so welcome that some motorists are now faking breakdowns just to get the food. Inevitably, there is much concern amongst the many people who make their living selling hot food from lay-bys the length and breadth of the nation, with calls for greater regulation. But one person who isn't troubled is Brenda Klimt, who operates from a trailer on the A40 just outside Gloucester. "It doesn't bother me," she said. "My greasy roadside baps have been pleasuring motorists for twenty years and, let me tell you, business has never been so good."